Heavily damaged buildings in Raqa, Syria, after a Kurdish-led force expelled Islamic State (IS) group fighters from their de facto capital. 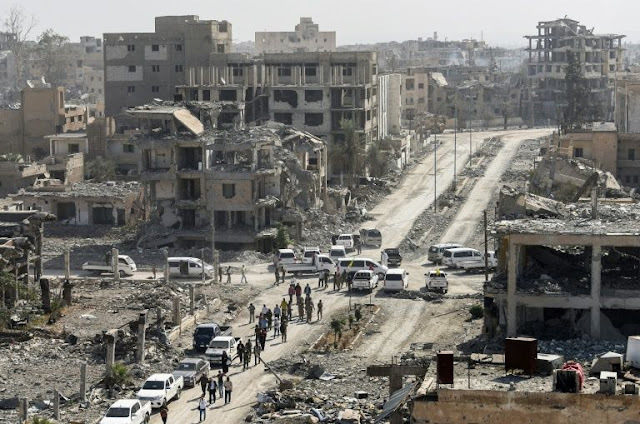 After IS lost its de facto capital Raqa in Syria this month, and its Iraqi stronghold of Mosul earlier, the group "has aspirations to establish a larger presence" in Africa, the US military's top officer General Joseph Dunford said on Monday. Along with five Nigerien troops, the US soldiers died on the Niger-Mali border in an attack carried out by locals associated with IS, according to Dunford. On Tuesday he meets military chiefs from 75 countries "to talk about the next phase of the campaign" against IS. The European Union's presidency also warned this month that countries in that bloc must monitor "very carefully" a growing IS threat in North Africa, where fighters have relocated. "I believe ISIS will attempt to establish a physical presence outside of Iraq and Syria" after losing Mosul and Raqa, the general added, using another acronym for IS. The United States is considering a stepped-up military presence in Africa to pursue Islamic State group jihadists looking for new havens after the fall of their "caliphate," American officials say. After IS lost its de facto capital Raqa in Syria this month, and its Iraqi stronghold of Mosul earlier, the group "has aspirations to establish a larger presence" in Africa, the US military's top officer General Joseph Dunford said on Monday.